I can't believe how fast this room filled up! I used to have the corner of a room that me and my Fiance shared as our office. Where did I put everything? I can hardly fit it all in here. This is the same view but slightly angled. the paper to fill in the racks. always up a the tip when you pull it down! This was a brilliant idea! of the sites that showed off their craft rooms. 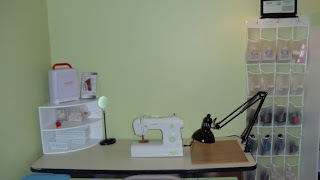 This is the transition into the sewing area. I still have some things that are not out of boxes yet. I haven't decided where to put this extra stuff. Imagine when it gets here. Hope you have enjoyed the pics! that you can share with me and everyone that visits this post. The Pink this month, you'll win this CGull Pink tool set! I can't wait to see and share your ideas! Wow! I love your room!! I am jealous. :) Thanks for sharing. For glitter glue (stickles, glue tiny round magnets on the bottom of the bottles. Underneath your shelf in scrap room, mount a baking pan. Then stick the bottles upside down(make sure covers are on tight!! LOL) for storage. When you go to use them, the glue will always be towards the top! Great job on the room! Thanks for the chance to win!! Wow!! !I am dead jealous!!! This is absolutely gorgeous! I just want to come and sit and stare! Awesome room. 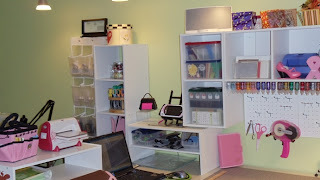 I love the storage idea for the Stickles. I have my buttons and brads stored in a clear sewing box with seperators so I could see what I have and it fits nicely on a shelf with other stuff. Gorgeous Design Studio!!! I love it!!! 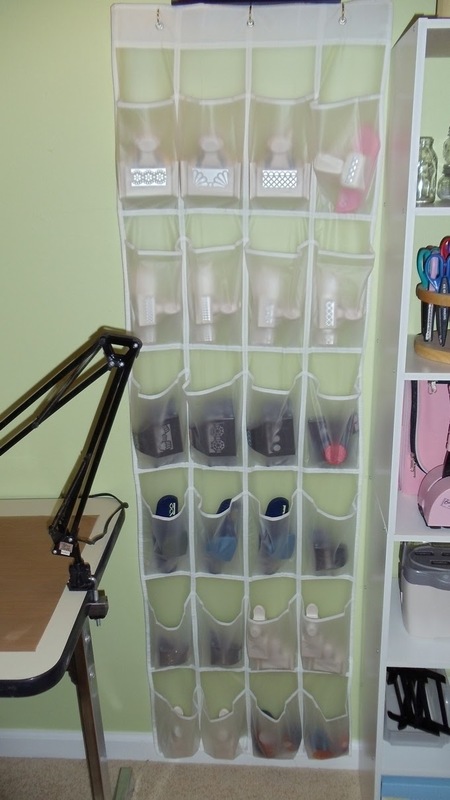 As for storage ideas, I have a lot of pink storage and tools in my room, and I look at places like Dollar General for cute pink storage. I have a pink wire napkin holder that holds my 6x6 pads perfectly and cutely. I have also found a pink wire utensil holder that is just like the one Cropper Hopper sells in white to hold pens and tools, I like mine so much better because it is not only pink, but it was just a couple bucks! I Love it. I'm so jealous, it is really beautiful. Thanks for sharing. I'm following you but it's under the name Zackmum. Let's see a great storage idea. The one that comes to mind is that I was watching a u stream with Pink Cricut the other night and they had this vinyl bag with holes in it where all their ribbon comes out a different hole it was awesome. not pretty but all the ribbon was kept in this bag and out of each hole hung a different piece of ribbon. they said that they bought it at Walmart. You should check out her U Stream to know what I'm talking about. please check out my blog if you get a chance. 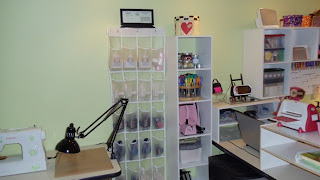 I use the CD/DVD holders in the office section of Walmart to store my Cricut overlays/books and cards! They have removable dividers so for the cards I keep them in and can sort them by type. I can always get right to a certain card when I need to shoot one off! You LUCKY gal!!!!!! My favorite part of your room??!! That idea for the stickles!!!!! AWESOME!!! Thanks for the chance!! 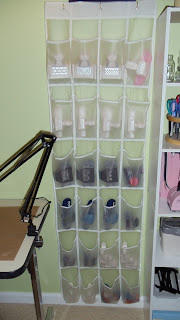 Love your room and thanks for sharing the great idea for the stickles bottles. I'm on my way to buy magnets. I've found a couple great storage ideas. My newest favorite is mounting a shelf under my Cricut table to hold my 12 x 24 paper pads. I also store my buttons in Frappe bottles that sit on a shelf over my work station. All my buttons are within easy reach and easy to see. My best organization/storage tip is to use office-supply "in and out" boxes for currently-working-on projects so they're quick at hand! Congrats on your new room and getting to fill it up! One of my favorite storage ideas is for clear stamps. I put them all in clear CD cases and label the end. I store all the cases in a wooden CD rack that I purchased from IKEA. It was unfinished wood, so I painted it to match my room colors (pink, black, and white). Yay, I'm slowly finding more scrappers in San Diego! Maybe we shouls organize a crop or swarm one of these days! Thanks for sharing your room and I can't wait to see all your paper organized! Wow! You're room looks great! I wish mine was half that organized!!! I don't think I have any super organizational tips... I do like to use those Iris cases from Michaels to keep all of my stuff in! Where did you get the metal paper holders? I am building my craft room tonight!!! 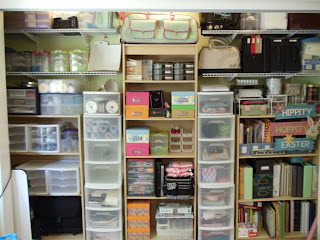 I am using the ELFA storage system to build shelves that will keep all my craft stuff organized! I love your new studio!! It's awesome...now I just have to get my stuff organized!! Beautiful!!! I can't even imagine having to pack all my stuff up and move it. I love my 7 drawer organizer for my scraps, which are sorted by color (2 colors per drawer). The stickles idea is brilliant!!! Love it! I'm sure that creating in this studio is going to be so much fun for you...enjoy your new space! TFS! At first, I thought he was crazy but it worked! I forgot to mention my storage idea! I use A4 plastic envelopes to store my clear stamps all in a 2 ring binder. Your room is great! I am jealous! My tip is that I use a pretty box from JoAnn Fabrics that's made to hold cards and store my cuttlebug embossing folders in it. Then I take some of my scraps in different colors and cut them to fit an A2 card and have them ready embossed. That way I can look through my box (which has dividers and labels of which folders they are) and pick one already embossed. WOW! Great room! My favorite organization piece is my scrap rack! It holds so much and the best way I've found to organize embelli's and my paper. GREAT room!!! I am totally jealous!!! I use fishing boxes to store my brads and buttons and such. WAYYY cheaper than "craft" specific container and works just the same. your room looks great!!! I am hoping to one day have a fantastic room just like this!!! WOW I love it! what an amazing space! love the room. I am working on organizing mine now that I have an extra room. My biggest problem is 12x12 paper . Love the punch idea. Your is so pretty. Your new room looks great! I have to share my "creation station" with formal dinners. Here is my link if you are interesting in having a boo at my work! Just starting out and looking for some new followers! 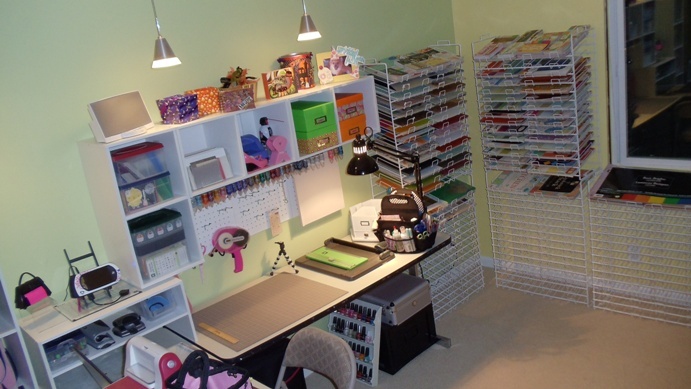 OMGosh, your craft room is beautiful! I like to use the SU clear stamp cases. I find the cd cases aren't big enough to hold big sets. What an amazing craft room you have really worked hard to make it just perfect. I hope you have years of enjoyment in it. I really like your room, and the idea for the stickles is great, that is one that I am gonna have to try. So I just started following your blog today and WOW love that room! 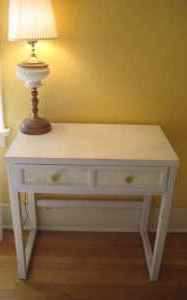 When my DH is done building mine you NEED to come do mine for me! I have to know... Where did you get those paper racks? I am looking now and can't really find anything that I like. I love your scrap room... I'm jealous!! I hope you enjoy it a lot!! TFS!! Take Care!! Who won the Gypsy? Or did I just miss the post. Great ideas. Love the stickles idea, going to have to try that I think once I get a few more of them. Thanks. OMG Julie! Your space is amazing! 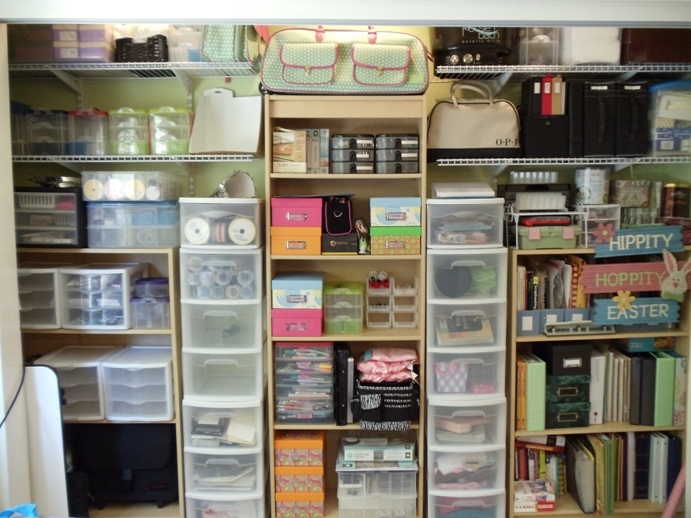 Lots of great tips for storage- thanks so much for sharing! 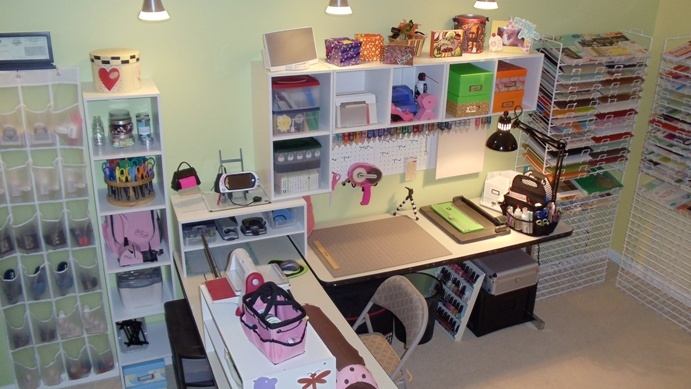 Great space for crafting. My favorite thing is the over the door shoe storage for Punches, etc. Thanks for all the wonderful tips.